Had planned to head down several sales lately but in the end, cancelled my plans. I had new acne popping up one side of my face and it was really troubling me. :( Couldn't figure out why they keep popping up on that side. My skin was also itching badly. I suspected I'm allergic to one of the cleansers I'm using. 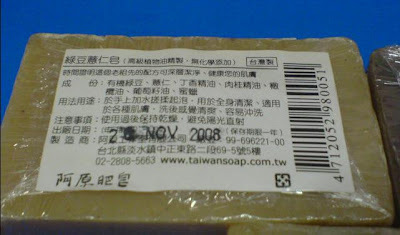 I recalled this entry I read about Ah Yuan organic soaps. I have been wanting to get them for some time but was a little lazy to go all the way down just to pick them up. Decided to get it since my skin seemed to be acting weird these days. 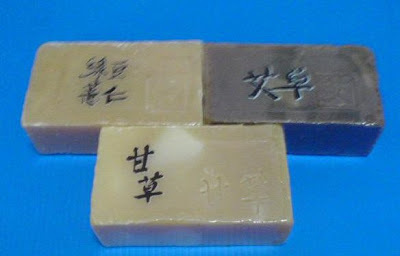 I bought three soaps: Organic Mung bean & Job’s tears, Wild Mugwort and Liquorice Hair. Mung bean & Job’s tears just mean green beans and barley. I'm using it on the face. 3 days into it and I can see my acne slowly clearing up. The bumps hidden beneath the skin are still there though. Can feel them. I hope to see miracles. I'll give a more detailed review after longer usage. Wild Mugwort soap is for my eczema/atopic dermatitis. It's supposed to help in relieving itching. So far it's all right. I've been itching and scratching so much. I wonder if it's due to the cold weather. I bought Liquorice Hair for my parents but they haven't started on it. It contains liquorice, ginger etc and is meant for oily scalp and improve hair growth. I just realised there is an ingredient list in English but I forgot to take photos of that instead (and I can't take pictures cos I've dismantled my soap). You can hop over here again to read it there. The soaps smell very herb-ish. For Organic Mung bean & Job’s tears, it doesn't smell as delicious like the dessert green bean soup. In fact, both Organic Mung bean & Job’s tears and Wild Mugwort smell the same to me, except the latter has a stronger smell. I find them expensive for a small bar of soap. Mung bean & Job’s tears costs $9+ while the other two costs $12+. Also had a chat with the salesperson there and she told me these soaps are selling very well. 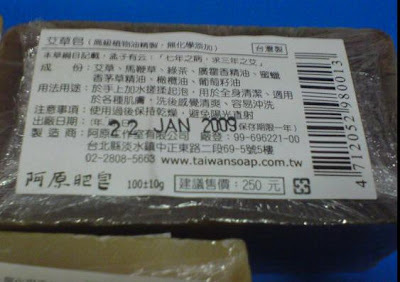 So sad when she told me these soaps are never on discount and the same price in Taiwan. When I picked these up, the shelves (or rather boxes) were half empty. There's like about 8-10 different types with their uses indicated there. I just realised those information are not indicated on the soap, so I'm a bit lost because I forgot all that information.) Haha. Anyway I've dug this thread and this site out with all the information there. If you are interested, hop over to NTUC The Living Pharmacy to pick it up. So far, I only know it's available at Lot 1 and Ang Mo Kio. Am not very sure about other branches. I'll do a proper review again after longer usage. I quite like the Organic Mung Bean & Job's Tear. I think my face whitened a lot using it. Only thing is that I'm uncomfortable with the squeaky clean feeling and if I'm not careful and let some of the soap get into my eyes, it stings!